Nigerian stylist, Toyin Lawani is not done calling out Big Brother Naija 2018 winner, Miracle for dumping his love interest Nina , publicly. 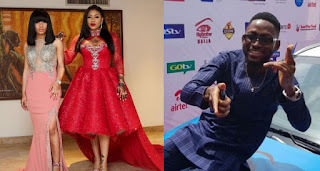 Toyin Lawani who called out Miracle yesterday in an insta-live video, also went on to slam him in a new Instagram post she shared today. 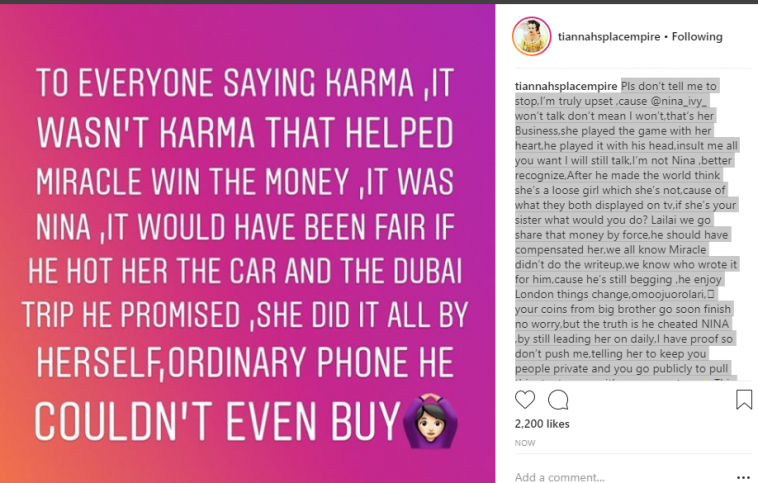 Toyin Lawani who debunked claims that karma worked against Nina who also dumped her boyfriend, Collins after the reality show, stated that Miracle is not used to wealth. The stylist who said Miracle should have compensated Nina as he won the show because of her, stated that his ‘bbn coins’ will finish soon. Toyin Lawani further maintained that she has proof that Miracle was leading Nina on everyday, before dumping her. According to her, Miracle was quite a huge distraction. Pls don’t tell me to stop,I’m truly upset ,cause @nina_ivy_ won’t talk don’t mean I won’t,that’s her Business,she played the game with her heart, he played it with his head,insult me all you want I will still talk, I’m not Nina , better recognize, After he made the world think she’s a loose girl which she’s not,cause of what they both displayed on tv, if she’s your sister what would you do? This will teach all of us not to make a long term decision on a temporary situation, lesson learnt. Happy she’s even more focused on her Businesses now 🙏He was a huge distraction to her.